Discussions of partisans throughout this report combine both those who identify with a party and those who lean toward one of the two major parties. Though Americans increasingly say they are politically independent, most of those who do not affiliate with a party lean Republican or Democratic. These partisan “leaners” tend to have attitudes and behaviors that are very similar to those of partisans, a dynamic long observed by political scientists and other political observers, as well as in prior Pew Research Center studies (see Appendix B of Pew Research Center’s 2014 study of Political Polarization in the American Public for more examples). In many cases, the attitudes of “all independents” can be misleading, since this tends to obscure real partisan differences within the group. This is the case when it comes to attitudes about the federal government, evaluations of the government’s job and views of the role government should play in key areas. On many evaluations of government, independents who lean to the Democratic Party differ greatly from those who lean to the Republican Party; moreover, leaners have very similar views as partisans of their party. For example, at least six-in-ten Democratic identifiers (69%) and leaners (62%) say the government should do more to solve problems, compared with no more than a third of Republican leaners (31%) and identifiers (23%). A similar pattern exists when it comes to overall evaluations of government performance: 33% of Democratic identifiers, along with 26% of leaners rate the government’s job of running its programs as excellent or good, while just one-in-ten Republican leaners (11%) and identifiers (10%) say the same. 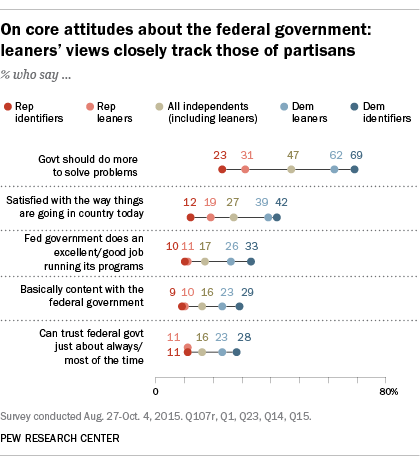 And on evaluations of the performance and role of the federal government in specific areas, the views of leaners closely map those of partisans, and are distinctly different from those who lean toward the other party. For instance, about four-in-ten of both Republican leaners (42%) and identifiers (39%) say the government is doing a good job ensuring access to health care; by comparison, 75% of Democratic identifiers and 72% of Democratic leaners say this. 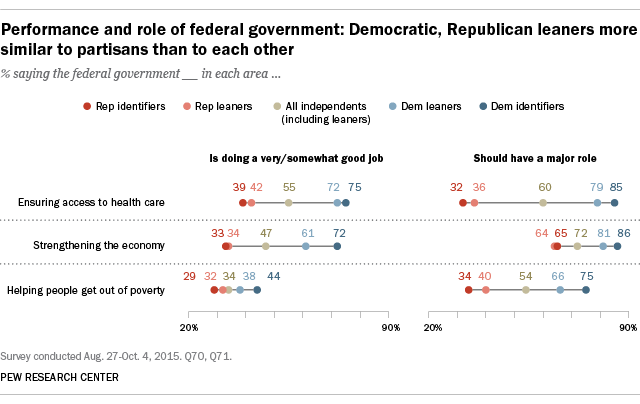 And while roughly a third of Republicans (32%) and GOP leaners (36%) say the government should play a major role in health care, among Democrats (85%) and Democratic leaners (79%) those proportions rise to around eight-in-ten. Though Democratic leaners are somewhat less likely than identifiers to evaluate the government positively when it comes to the economy, the 9-percentage-point difference in these views (61% vs. 72%, respectively) is far more modest than the 27-point difference between Republican leaners and Democratic leaners. In each of these cases, reporting on a single “independent” category would have provided a contrast with Republicans and Democrats (those data points are plotted in the middle of the above graphics). But, since more than three-quarters of independents lean toward a party (to date in 2015, 37% lean to the GOP, 41% lean Democratic and 22% do not lean to either party), reporting on an independent group that is primarily the combination of these two dramatically different groups would be misleading; these are two groups that have little in common with each other, and far more in common with self-identified partisans. In some cases throughout this report, those who lean neither to the Republican Party nor to the Democratic Party are discussed when they differ markedly from other groups.